For the restaurant chain, see Penang (restaurant chain). Penang's population stood at nearly 1.767 million as of 2018[update], while its population density rose to 1,684/km2 (4,360/sq mi). It has among the nation's highest population densities and is one of the country's most urbanised states. George Town, Malaysia's second largest city, is also home to a UNESCO World Heritage Site. Penang's modern history began in 1786, upon the establishment of George Town by Francis Light. Penang formed part of the Straits Settlements in 1826, which became a British crown colony in 1867. Direct British rule was only briefly interrupted during World War II, when Japan occupied Penang; the British retook Penang in 1945. Penang was later merged with the Federation of Malaya (now Malaysia), which gained independence from the British in 1957. Following the decline of its entrepôt trade towards the 1970s, Penang's economy was reoriented towards hi-tech manufacturing. Known as the Silicon Valley of the East for its industries, Penang is one of Malaysia's most vital economic powerhouses. Penang has the highest Gross Domestic Product per capita among all Malaysian states and is considered a high-income economy. In addition, Penang recorded the nation's second highest Human Development Index, after Kuala Lumpur. Correspondingly, the state has a relatively well-educated population, with a youth literacy rate of 99.5% as of 2014[update]. Its heterogeneous population is highly diverse in ethnicity, culture, language and religion. Aside from the three main races, the Chinese, Malays and Indians, Penang is home to significant Eurasian, Siamese and expatriate communities. A resident of Penang is colloquially known as a Penangite or Penang Lâng (in Penang Hokkien). The name, Penang, comes from the modern Malay name Pulau Pinang, which means The Island of the Areca Nut Palm (Areca catechu). The State of Penang is also referred to as the Pearl of the Orient and Pulau Pinang Pulau Mutiara (Penang Island, The Island of Pearls). Penang Island was originally known by native seafarers as Pulau Ka-Satu, meaning The First Island, because it was the largest island encountered on the trading sea-route between Lingga and Kedah. Similarly, the Siamese, then the overlord of Kedah, referred to the island as Koh Maak (Thai: เกาะหมาก). In the 15th century, Penang Island was referred to as Bīnláng Yù (simplified Chinese: 槟榔屿; traditional Chinese: 檳榔嶼) in the navigational drawings used by Admiral Zheng He of Ming China. Emanuel Godinho de Eredia, a 16th-century Portuguese historian, also referred to the island as Pulo Pinaom in the Description of Malacca. Human remains, dating back to about 5,000 to 6,000 years ago, have been uncovered in Seberang Perai, along with seashells, pottery and hunting tools. These artifacts indicate that the earliest inhabitants of Penang were nomadic Melanesians during the Neolithic era. The Cherok Tok Kun megalith in Bukit Mertajam, uncovered in 1845, contains Pali inscriptions, indicating that the Hindu-Buddhist Bujang Valley civilisation based in what is now Kedah had established control over parts of Seberang Perai by the 6th century. The entirety of what is now Penang would later become part of the Sultanate of Kedah up to the late 18th century. However, the modern history of Penang only began in the late 18th century. In the 1770s, Francis Light was instructed by the British East India Company to form trade relations in the Malay Peninsula. Light subsequently landed in Kedah, which was by then a Siamese vassal state. Aware that the Sultanate was under external and internal threats, he promised British military protection to the then Sultan of Kedah, Sultan Muhammad Jiwa Zainal Adilin II; in return, the Sultan offered Penang Island to the British. British acquisition and expansion of Penang (in yellow) occurred between 1786 and 1874, when the final alterations to Penang's boundaries was enacted. It was only in 1786 when the British East India Company finally ordered Light to obtain the island from Kedah. Light negotiated with the new Sultan of Kedah, Sultan Abdullah Mukarram Shah, regarding the cession of the island to the British East India Company in exchange for British military aid. After an agreement between Light and the Sultan was ratified, Light and his entourage sailed on to Penang Island, where they arrived on 17 July 1786. Light took formal possession of the island on 11 August "in the name of His Britannic Majesty, King George III and the Honourable East India Company". Penang Island was renamed the Prince of Wales Island after the heir to the British throne, while the new settlement of George Town was established in honour of King George III. Unbeknownst to Sultan Abdullah, Light had been acting without the authority or the consent of his superiors in India. When Light reneged on his promise of military protection, the Kedah Sultan launched an attempt to recapture the Prince of Wales Island in 1791; the British East India Company subsequently defeated the Kedah forces. In 1800, Lieutenant-Governor Sir George Leith secured a strip of hinterland across the Penang Strait and named it Province Wellesley (now Seberang Perai). Province Wellesley was then gradually expanded up to its present-day boundaries in 1874. In exchange for the acquisition, the annual payment to the Sultan of Kedah was increased to 10,000 Spanish dollars per annum. To this day, the Malaysian federal government still pays Kedah, on behalf of Penang, RM 10,000 annually as a symbolic gesture. Light founded George Town as a free port to entice traders away from nearby Dutch trading posts. Simultaneously, spices were harvested on the island, turning it into a regional centre for spice production. Consequently, maritime trade at the Port of Penang grew exponentially; the number of incoming vessels rose from 85 in 1786 to 3,569 in 1802. In 1805, Penang became a separate presidency of British India, sharing similar status with Bombay and Madras. By 1808, a local government for George Town was in place, whilst the establishment of the Supreme Court of Penang marked the birth of Malaysia's modern judiciary. In 1826, Penang, Singapore and Malacca were incorporated into the Straits Settlements, with George Town as the capital. However, Penang's importance was soon supplanted by Singapore, as the latter rapidly outstripped the Port of Penang as the region's premier entrepôt. In 1832, Singapore replaced George Town as the capital of the Straits Settlements. Even so, the Port of Penang retained its importance as a vital British entrepôt. Towards the end of the 19th century, it became a major tin-exporting harbour. George Town concurrently evolved into Malaya's principal financial hub, as banks and mercantile firms flocked into the city. Meanwhile, other towns, including Bayan Lepas on the island, and Butterworth and Bukit Mertajam in Province Wellesley, emerged due to agricultural and logistical developments. Throughout the century, Penang's cosmopolitan population, comprising Chinese, Malay, Indian, Peranakan, Eurasian, Thai and other ethnicities, grew rapidly in tandem with the economic prosperity. However, the population growth also led to social problems, such as inadequate sanitation and public health facilities, as well as rampant crime, with the latter culminating in the Penang Riots of 1867. Also in 1867, the Straits Settlements was made a British crown colony. Direct British rule meant better law enforcement, as the police force was beefed up and the secret societies that had previously plagued Penang were gradually outlawed. More investments were also made on health care and public transportation. Due to the improved access to education, the active participation in municipal affairs by its Asian residents and substantial press freedom, George Town was perceived as being more intellectually receptive than Singapore. The city became a magnet for reputable English authors, Asian intellectuals and revolutionaries, including Rudyard Kipling, Somerset Maugham and Sun Yat-sen.
During World War I, in the Battle of Penang, the German cruiser SMS Emden surreptitiously sailed to Penang Island and sank two Allied warships off its coast. 147 French and Russian sailors perished during the battle. World War II, on the other hand, led to unparalleled social and political upheaval. Although Penang Island had been designated as a fortress, Penang fell to the Imperial Japanese Army on 19 December 1941, after suffering devastating aerial attacks. The British covertly evacuated Penang's European populace; historians have since contended that the moral collapse of British rule in Southeast Asia came not at Singapore, but at Penang. Penang Island was subsequently renamed Tojo-to, after the then Japanese Prime Minister Hideki Tojo. The period of Japanese occupation was renowned for the Imperial Japanese Army's massacres of Penang's Chinese populace, known as Sook Ching to the locals. Women in George Town were also coerced to work as comfort women by the Japanese. Meanwhile, the Port of Penang was put to use as a major submarine base by the Axis Powers. In the last years of the war, Allied bombers from India repeatedly bombed George Town, seeking to destroy the naval facilities and administrative centres. Several colonial buildings were destroyed or damaged, such as the Government Offices, St. Xavier's Institution and Hutchings School (now Penang State Museum). The Penang Strait was also mined to constrict Japanese shipping. 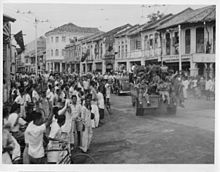 Following the surrender of Japan, British forces launched Operation Jurist to recapture Penang Island on 3 September 1945, making George Town the first city in Malaya to be liberated from the Japanese. Penang was placed under a military administration until 1946. Subsequently, the Straits Settlements was abolished, as the British sought to consolidate the various political entities in British Malaya under a single polity named the Malayan Union. The now separate Crown Colony of Penang was consequently merged into the Malayan Union, which was then replaced by the Federation of Malaya in 1948. The idea of the absorption of Penang into the vast Malay heartland initially proved unpopular amongst Penangites. Economic and ethnic concerns led to the formation of the Penang Secessionist Committee in 1948. However, the committee's attempt to avert Penang's merger with Malaya ultimately petered out due to British disapproval. The British government allayed the concerns raised by the secessionists by guaranteeing George Town's free port status, as well as reintroducing municipal elections in George Town in 1951. By 1956, George Town became the first fully elected municipality in Malaya and in the following year, it was granted city status by Queen Elizabeth II, becoming the first city within the Federation of Malaya, and by extension, Malaysia. The Komtar Tower, Penang's tallest skyscraper, was built in the 1970s. George Town was, since colonial times, a free port - until its sudden revocation by the Malaysian federal government in 1969. Penang subsequently suffered an economic crisis, with the loss of maritime trade resulting in massive unemployment and brain drain. To alleviate the downturn, the then Chief Minister, Lim Chong Eu, masterminded the construction of the Bayan Lepas Free Industrial Zone. The zone, regarded by many as the Silicon Valley of the East, proved instrumental in reversing Penang's economic slump and led to the state's rapid economic growth until the late 1990s. During Lim's tenure, a number of major infrastructural projects were also undertaken, chiefly the Penang Bridge, the first road link between Penang Island and the Malay Peninsula. Completed in 1985, it was the longest bridge in Southeast Asia until 2014 when it was superseded by the Second Penang Bridge. The 2004 Indian Ocean tsunami hit parts of Penang Island, killing 52 people (out of 68 in all of Malaysia). However, the persistent brain drain, exacerbated by federal government policies that favoured the development of Kuala Lumpur, meant that Penang was no longer at the forefront of the country's economy by the 2000s. Penang's economy slowed down in the early 2000s, while the deteriorating state of affairs in general, including an incoherent urban planning policy, poor traffic management and the dilapidation of George Town's heritage buildings due to the repeal of the Rent Control Act in 2001, led to simmering discontent within Penang's society. In response, George Town's non-governmental organisations (NGOs) and the national press galvanised public support and formed strategic partnerships to restore the city to its former glory. Also as a result of the widespread resentment, the then federal opposition coalition, Pakatan Rakyat (now Pakatan Harapan), was voted into power within Penang in the 2008 State Election, replacing the erstwhile administration led by the Barisan Nasional. Meanwhile, the efforts to conserve George Town's heritage architecture paid off, when in 2008, the city's historical core was inscribed as a UNESCO World Heritage Site. With a total land area of just 1,048 km2 (405 sq mi), Penang is the second smallest state in Malaysia by land mass after Perlis. Penang, situated at the northwestern coastline of Peninsular Malaysia, lies between latitudes 5.59° and 5.12°N, and longitudes 100.17° and 100.56°E. The state consists of Penang Island, Seberang Perai (a narrow strip of the Malay Peninsula) and a handful of smaller islets. Its capital city, George Town, is located at the northeastern tip of Penang Island. Penang is geographically divided into two major halves physically divided by the Penang Strait. Penang Island, a 293 km2 (113 sq mi) island. Seberang Perai, a 751 km2 (290 sq mi) hinterland on the Malay Peninsula. It is bordered by Kedah to the east and north, and by Perak to the south. The Penang Strait is further divided into the North Channel and the South Channel. At the strait's narrowest section, George Town on the island is separated from Butterworth on the mainland by a mere 3 km (1.9 mi). Penang Island is irregularly shaped, with a hilly and mostly forested interior; its coastal plains are narrow, the most extensive of which is at the northeastern cape. With a height of 833 m (2,733 ft), Penang Hill, at the centre of the island, is the tallest point within Penang. From a small settlement at the northeastern tip of Penang Island, George Town has expanded over the centuries, particularly in the northwestern, western and southern directions, eventually linking up with Bayan Lepas at the island's southeast and urbanising the entire eastern coast of the island. Meanwhile, the topography of Seberang Perai is mostly flat, save for a few hills such as Bukit Mertajam. The major rivers within Penang include the Pinang, Perai, Muda and Kerian rivers. In particular, the Muda River serves as the northern border between Seberang Perai and Kedah, while the Kerian River forms the southern boundary between Seberang Perai, Kedah and Perak. Due to land scarcity, land reclamation projects have been undertaken in high-demand areas such as Tanjung Tokong, Jelutong and Gurney Drive. The Penang Botanic Gardens was founded in 1884 as an offshoot of the Singapore Botanic Gardens. In spite of rapid urbanisation, Penang has still managed to safeguard a considerable area of natural environment. Within the state, 7,761 ha (77.61 km2) have been designated as protected forest reserves. The central hills of Penang Island, including Penang Hill, serve as the green lung for the urbanised island. Two of the major parks within George Town - the Penang Botanical Gardens and the City Park - are situated near the hills. Penang is also home to the smallest national park in the world - the Penang National Park. Covering 2,562 ha (25.62 km2) of the northwestern tip of Penang Island, it encompasses mangrove swamps, rainforest interspersed with hiking trails and tranquil beaches. Other notable natural attractions nearby include the Tropical Spice Garden and the Entopia Butterfly Farm, the latter of which was Malaysia's first butterfly sanctuary. In Seberang Perai, the Penang Bird Park, established in 1988 in Seberang Jaya, was the first aviary in Malaysia. Penang also consists of nine other islets off its coasts. The biggest of all, Jerejak Island, is located in the South Channel of the Penang Strait. Once the site of a leper asylum built in 1868, which was later converted into a maximum-security penitentiary, Jerejak Island remains heavily forested. The other islets under the jurisdiction of Penang include Aman, Betong, Gedung, Kendi and Rimau. A map of Penang with the locations of the capital city of George Town and its suburbs, and other major towns. Map of the Greater Penang Conurbation, which encompasses Penang, southern Kedah and northern Perak. Penang forms the heart of the Greater Penang Conurbation, Malaysia's second biggest conurbation. Centred in George Town, the metropolitan area encompasses the entire State of Penang, southern Kedah and northern Perak. As of 2010[update], Greater Penang had nearly 2.5 million residents, second only to Greater Kuala Lumpur (Klang Valley). Greater Penang also generated a GDP of US$13,596,418 in 2010, making the conurbation the second biggest contributor of Malaysia's GDP after Greater Kuala Lumpur. Penang, being a former British crown colony, is one of only four Malaysian states without hereditary monarchies. The head of state of Penang is the Governor (Malay: Yang di-Pertua Negeri), who is appointed by the King of Malaysia (Malay: Yang di-Pertuan Agong). The present Governor of Penang, Abdul Rahman Abbas, assumed office in 2001. In practice, the Governor is a figurehead whose functions are chiefly symbolic and ceremonial. The Penang state government has its own executive council and legislature, but they have relatively limited powers in comparison with those of the Malaysian federal government. According to the Malaysian Federal Constitution, the state may legislate on matters pertaining to Malay customs, land, agriculture and forestry, local government, civil and water works, and state administration, whereas matters that fall under the joint purview of both state and federal authorities include social welfare, wildlife protection and national parks, scholarships, husbandry, town planning, drainage and irrigation, and public health and health regulations. The Constitution of Penang, codified in 1957, embodies the state's highest laws. Consisting of 42 articles, the constitution pertains to the proceedings and powers of the state government. The 68-storey Komtar Tower (centre) in George Town also houses the Office of the Chief Minister of Penang. The Penang State Executive Council is the executive authority of the Penang state government, similar in function to the national Cabinet. It is led by the Chief Minister, who serves as the head of government in Penang. To this day, Penang remains the only Malaysian state where the position of the head of government has been continuously held by an ethnic Chinese since the nation's independence in 1957. The current Chief Minister of Penang is Chow Kon Yeow of the Democratic Action Party (DAP), who assumed office after the 2018 State Election. Following the 2008 State Election, the Pakatan Rakyat coalition (now Pakatan Harapan), which at the time consisted of the DAP, the People's Justice Party (PKR) and the Malaysian Islamic Party (PAS), formed the Penang state government, with the head of government going to the former for being the single largest party in the state legislature. 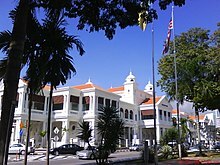 The State Assembly Building in George Town, where the Penang State Legislative Assembly convenes. The unicameral 40-seat Penang State Legislative Assembly, whose members are called State Assemblymen, convenes at the neoclassical Penang State Assembly Building in George Town. Penang practises the Westminster system whereby members of the Penang State Executive Council are appointed from amongst the elected State Assemblymen. Moreover, the dissolution of the Penang State Legislative Assembly, typically conducted prior to a State Election, requires the consent of the Governor of Penang. Following the 2018 State Election, the Pakatan Harapan (PH) coalition commands a supermajority in the legislature by controlling 37 seats. Out of the 37 PH seats, 19 are retained by the Democratic Action Party (DAP), 14 by the People's Justice Party (PKR), two by the Malaysian United Indigenous Party (Bersatu) and two by the National Trust Party (Amanah). The state opposition is formed by the Barisan Nasional (BN) coalition, which holds two seats, and the Malaysian Islamic Party (PAS), which occupies one seat. Amendments to Penang's Constitution require the support of two-thirds of the Penang State Legislative Assembly. The Penang Island City Council administers the city of George Town, which includes the entirety of Penang Island. It is made up of a mayor, a city secretary and 24 councillors. The Seberang Perai Municipal Council is in charge of Seberang Perai. Similar in structure to the city council, it consists of a president, a municipal secretary and 24 councillors. Both the mayor and the president are appointed by the Penang state government for a two-year term, while the councillors are appointed for one-year terms of office. The local councils are responsible, among others, for regulating traffic and parking, maintaining cleanliness and drainage, managing waste disposal, issuing business licenses, and overseeing public health. Penang is also divided into five administrative districts - two on Penang Island and three in Seberang Perai. Each district is headed by a district officer. The lands and district office in each district deals with land administration and revenue; thus it differs from the local governments (city or municipal council) which oversee the provision and maintenance of urban infrastructure. The Malaysian legal system had its roots in 19th-century George Town. In 1807, a Royal Charter was granted to Penang which provided for the establishment of a Supreme Court. 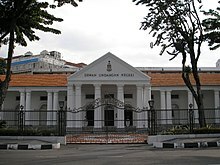 The Supreme Court of Penang, then sited at Fort Cornwallis, was opened in 1808. Sir Edmond Stanley assumed office as the First Recorder of the Supreme Court in 1808, thus serving as the first Superior Court Judge in British Malaya. The legal establishment in Penang was progressively extended to the whole of Malaya by 1951. Today, the Penang High Court in George Town sits at the pinnacle of the hierarchy of courts within Penang. There are also four Magistrates Courts and two Sessions Courts scattered throughout the state. A total of 18 countries have either established their consulates or appointed honorary consuls within Penang. The State of Penang has also ratified a sister state agreement with Japan's Kanagawa Prefecture and a friendship state agreement with China's Hainan Province. In addition, George Town is twinned with eight sister cities and five friendship cities, while Seberang Perai has four sister cities. Penang, with an estimated population of 1,766,800 as of 2018[update], has the highest population density of all Malaysian states (excluding Kuala Lumpur), at 1,684/km2 (4,360/sq mi). In addition, Penang is one of the most urbanised Malaysian states, with an urbanisation level of 90.8% as of 2015[update]. Due to its vibrant economy, Penang is also one of the major recipients of interstate migrants within Malaysia. Between 2015 and 2016, Penang achieved the highest migration effectiveness ratio among Malaysian states; for every 100 Malaysians that migrated into and out of Penang, the state's population increased by 58 persons. The bulk of the interstate immigrants came from Perak, Selangor, Kedah, Johor and Kuala Lumpur. Penang's population is almost equally distributed between the island and the mainland. Penang Island had a population of 722,384 as of 2010[update] and a population density of 2,465.47/km2 (6,385.5/sq mi). The Greater Penang Conurbation, which also covers parts of neighbouring Kedah and Perak, is the second largest metropolitan area in the nation, with almost 2.5 million inhabitants as of 2010[update]. Whilst Penang has historically been regarded as a predominantly Chinese state, in recent years, the proportion of Bumiputeras within the state, which include ethnic Malays and East Malaysian indigenous races, has reached parity with that of the Chinese. 2018 estimates from Malaysia's Department of Statistics showed that the Bumiputeras constituted more than ​ 2⁄5 of Penang's population, whereas the Chinese made up another ​ 2⁄5. Ethnic Indians comprised nearly ​ 1⁄10 of the state's populace. In particular, George Town remains a Chinese-majority city, with the Chinese making up over half of the city's population as of 2010[update]. George Town's Chinese populace includes the Peranakan, a hybrid ethnicity whose rich legacies can still be seen to this day in the form of distinctive architectures, costumes and cuisine. Moreover, the city is also renowned for its more cosmopolitan population, which also comprises indigenous East Malaysians, the Eurasians and the Siamese. Meanwhile, the Malays have formed the plurality in Seberang Perai. In addition, Penang is home to a sizeable expatriate population, especially from Singapore, Japan and various Asian countries, as well as other Commonwealth nations. Almost 9% of Penang's population consisted of foreigners, reflecting the well-established allure of Penang amongst expatriates. Most expatriates settle within the vicinity of George Town; the city's northern suburbs, such as Tanjung Tokong, Tanjung Bungah and Batu Ferringhi, are particularly popular. The four major languages widely spoken in Penang are Malay, English, Chinese and Tamil. However, Penang is best known for its distinct Hokkien language, known as Penang Hokkien. Under British rule, English was the official language in Penang. The mushrooming of English and missionary schools throughout George Town contributed greatly to the widespread use of the language in the state. As in the rest of Malaysia, Malay is currently the official language in Penang. The Malays in Penang also use a variant of the Kedah Malay dialect, with slight modifications made to the original dialect to suit the conditions of an urban, cosmopolitan society. Tamil is the most widely spoken language amongst Penang's Indian community. There are also other Indian languages spoken by minority Indians such as Telugu and Punjabi who hailed from diverse ancestries in the Indian subcontinent. Meanwhile, Penang's Chinese population uses a variety of Chinese dialects, including Hakka and Cantonese. Mandarin, more commonly used by youths, has been the medium of instruction in Chinese schools throughout the state. However, it is Penang Hokkien that serves as the lingua franca of Penang. Originally a variant of the Minnan language, Penang Hokkien has absorbed numerous loanwords from Malay and English, yet another legacy of the Peranakan culture. It is spoken by many Penangites irrespective of race for communication purposes. Greater emphasis has been placed on preserving the language's relevance in the face of the increasing influence of Mandarin and English among the youth. As with other Peninsular states, Islam is the official religion of the State of Penang. Even so, other religions are allowed to be practised within the state, contributing to its cosmopolitan society. As of 2010[update], Muslims constituted over 44% of Penang's population, followed by the Buddhists at nearly 36% and the Hindus at almost 9%. Notably, smaller communities of Chinese Muslims and Indian Muslims have long existed within George Town, while most Buddhists in Penang follow either Theravada, Mahayana or Vajrayana traditions. A significant multiracial community of Christians, of both Catholic and Protestant sects, also exist in Penang, consisting of ethnic Chinese, Indians, Eurasians, East Malaysian migrants and expatriates. Meanwhile, more than 10% of the state's Chinese populace adhere to Taoism and other Chinese folk religions. One particular street in George Town exemplifies the harmonious coexistence of the various religions in Penang. Along Pitt Street, Muslim, Taoist, Hindu and Christian places of worship are situated just metres away from one another, earning the street its nickname, the Street of Harmony. This reflects Penang's diverse ethnic and socio-cultural amalgamation. There was once a tiny and little-known community of Jews in George Town, who mainly resided along Jalan Zainal Abidin (formerly Yahudi Road). The last known native Jew died in 2011, rendering the centuries-old Jewish community in Penang effectively extinct. In spite of its tiny size, Penang, regarded as the Silicon Valley of the East, has one of the largest economies in Malaysia, contributing as much as RM7 billion of the country's tax income in 2015. Penang has the highest Gross Domestic Product (GDP) per capita among Malaysian states. With a GDP per capita of RM49,873 as of 2017[update], Penang has also surpassed the World Bank's threshold to be considered a high-income economy, which was set at US$12,056 within the same year. Furthermore, Penang consistently records one of the lowest unemployment rates within the nation - 2.1% as of 2017[update]. The state has experienced one of the largest reductions in Gini coefficient within Malaysia as well, at 0.356 in 2016. Penang is the top destination within Malaysia for foreign investors; the state held the largest share of Malaysia's foreign direct investment (FDI) in 2017, gaining nearly ​2⁄5 of the nation's overall FDI. In addition, George Town was ranked Malaysia's most attractive destination for commercial property investment by Knight Frank in 2016, surpassing even Kuala Lumpur. The bulk of Penang's FDI as of 2017[update] originated from Switzerland, Germany, Hong Kong, the Netherlands, Ireland and Singapore. Penang's economic growth, particularly since 2008, was described by Bloomberg as Malaysia's "biggest economic success", despite the federal government's focus on other states such as Johor and Sarawak. Penang's economic performance also allowed the Penang state government to completely eradicate the state's public debt by 2016. Since the 1970s, manufacturing has formed the backbone of Penang's economy, contributing 44.8% of the state's GDP as of 2017[update] and attracting as many as 3,000 firms to set up operations within the state. Machinery and transport equipment accounted for 71% of Penang's total exports during the first nine months of 2014. The Bayan Lepas Free Industrial Zone, now regarded as the Silicon Valley of the East, is the main electronics manufacturing hub within Malaysia. Located at the southeastern corner of Penang Island, the zone is home to several high-tech multinational firms, including Dell, Intel, AMD, Motorola, Agilent, Renesas, Osram, Bosch, Sony and Seagate. Seberang Perai has witnessed massive industrialisation as well, with industrial estates and oil refineries being established in the late 20th century in areas like Mak Mandin and Perai. The major local firms currently operating in Perai, including Malayan Sugar, Malayawata Steel, Southern Steel, Harvik Rubber and Soon Soon Oilmills, have been joined by multinational companies, such as Mattel, Pensonic, Hitachi, Mitsuoka, Chevron and Honeywell Aerospace. In recent years, Batu Kawan has also been rapidly industrialised, with a number of international firms, such as Boston Scientific and Bose Corporation, setting up manufacturing plants in the town. Aside from electronics and engineering manufacturing, Penang is Malaysia's main jewellery finishing hub, contributing 85% of the nations's gold and jewellery exports as of 2016[update]. Penang's gold and jewellery industry is relatively well-established, dating back to the founding of the Penang Goldsmith Association in 1832. Jewellery from Penang is exported to over 20 foreign markets, including Singapore, Hong Kong, Japan, Canada and the United States. Design Village in Batu Kawan is the largest outlet mall in Malaysia. The services sector has overtaken the manufacturing sector as the largest economic sector in Penang, with the former accounting for 49.3% of Penang's GDP as of 2017[update]. In addition, almost ​3⁄5 of Penang's workforce are employed in services-related industries, which include retail, accommodation, medical tourism, and food and beverages (F&B) sub-sectors. Medical tourism has emerged as an integral component of Penang's services sector. George Town, in particular, has become the centre of medical tourism within Malaysia, attracting approximately half of the nation's medical tourist arrivals in 2013 and generating about 70% of the country's medical tourism revenue. Penang also has a vibrant retail sub-sector, which employs as many as 24% of Penang's workforce. As the main shopping destination in northern Malaysia, Penang is home to several shopping malls, such as Gurney Plaza, Gurney Paragon, 1st Avenue Mall, Straits Quay, Queensbay Mall and Design Village. While shopping malls now dominate the retail scene, centuries-old shophouses are still operating alongside George Town's flea markets and wet markets, all of which cater more to local products, including spices, nutmegs and tau sar pneah, a famous Penang delicacy. Due to the efforts of the Penang state government to promote the state as a shared services and outsourcing (SSO) hub, Penang has attracted the second largest share of investments for Global Business Services (GBS) within Malaysia, after Kuala Lumpur. Penang's SSO industry, which includes international corporations such as AirAsia, Citigroup, Jabil and Dell, has provided more than 8,000 high-income jobs and contributed RM12.79 billion of revenue in 2013. In addition to these, a startup community has been growing within Penang, including the likes of Piktochart and DeliverEat. Attracted by the cheaper living costs and the presence of several multinational technology firms, Penang's startups are also being actively encouraged by the public and private sectors, with initiatives to encourage entrepreneurship and promote the Internet of Things (IoT). Furthermore, George Town is Malaysia's second most popular centre for meetings, incentives, conferences and exhibitions (MICE), after Kuala Lumpur. In 2017, Penang hosted 2,511 business events with an estimated economic impact of RM1.002 billion. Among the major MICE venues within Penang are the SPICE Arena, Straits Quay and Prangin Mall. George Town was formerly the financial centre of British Malaya. 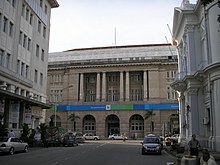 The first international bank to open a branch in George Town (and by extension, Malaysia) was Standard Chartered in 1875. This was followed by HSBC and the Royal Bank of Scotland in 1885 and 1888 respectively. To this day, George Town still serves as the financial centre of northern Malaysia. The city contains various Malaysian and international banks, including Standard Chartered, HSBC, Citibank, UOB, OCBC, Bank of China and Bank Negara Malaysia. Most of the international banks still retain their offices at Beach Street, which also serves as the city's main Central Business District. Since the 1990s, Northam Road, along with Gurney Drive, has also emerged as the George Town's second Central Business District. Northam Road, in particular, hosts an array of financial services, including the Malaysian Employees Provident Fund, as well as accounting, auditing and insurance offices. Finance and its related activities, such as insurance, auditing and real estate transactions, accounted for more than 8% of Penang's Gross Domestic Product (GDP) as of 2017[update]. Penang has always been one of the most popular tourist destinations in Malaysia. Throughout history, the state welcomed some of the most influential personalities, including W. Somerset Maugham, Rudyard Kipling, Lee Kuan Yew, Queen Elizabeth II and Prince Charles. Penang is known for its rich heritage and architecture, its vibrant multicultural society, a wide range of modern entertainment and retail choices, natural features such as beaches and hills, and the world-famous Penang cuisine. Unlike other Malaysian states, Penang does not rely only on air transportation for tourist arrivals. Aside from the Penang International Airport, Swettenham Pier, conveniently located within the heart of George Town, has emerged as one of the major tourist entry points into the state. As of 2017[update], Penang attracted nearly 8.6 million tourists, with the airport posting a record 7.2 million passenger arrivals and the pier registering another 1.35 million tourist arrivals. Within the same year, Penang, which contributed close to RM3.9 million of tourism tax revenue, was Malaysia's third largest tourism tax contributor after Kuala Lumpur and Sabah. In recent years, George Town has received numerous international accolades. The city has been listed by several publications, including the Lonely Planet, CNN, Forbes and Time, as one of Asia's top travel destinations. These are in addition to George Town's reputation as a gastronomic haven, with the CNN placing George Town as one of Asia's best street food cities. Formerly a vital British entrepôt, Penang's maritime trade has greatly declined, due to the loss of George Town's free-port status in 1969 and the concurrent development of Port Klang near the federal capital Kuala Lumpur. 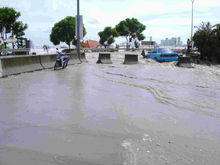 In spite of this, the Port of Penang remains the main harbour within northern Malaysia. The Port of Penang handled more than 1.52 million TEUs of cargo in 2017, making it the third busiest seaport by volume in the country. The Port's strategic location enabled it to service not just northern Malaysia, but also southern Thailand. Penang's diverse, cosmopolitan society means that there are a great many celebrations and festivities in any given year. The major cultural and religious festivities in the state include, but not limited to, the Chinese New Year, Eid ul-Fitri, Deepavali, Thaipusam, Vaisakhi, Christmas, Vesak Day and Songkran. Expatriates residing in Penang have also introduced a host of other celebrations. Bon Odori is celebrated yearly by the Japanese in George Town, while St. Patrick's Day and Oktoberfest, traditionally celebrated by the Irish and the Germans respectively, have also been gaining popularity amongst the locals. Moreover, Penang hosts several major festivals in any given year. The George Town Festival, first held in 2010, has evolved into one of the largest arts events in Southeast Asia, while the Penang Hot Air Balloon Fiesta attracts close to 200,000 visitors from all over the world. George Town is the birthplace of a unique form of the Chingay procession. 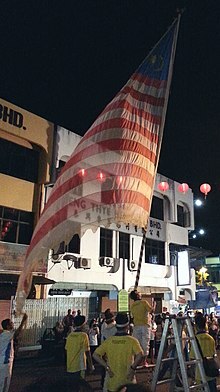 Introduced in 1919, Penang's variant of Chingay includes the act of balancing gigantic flags on one's forehead or hands. A yearly Chingay parade is held in the city every December, though Chingay performances are also a common feature of Chinese festivities and major state celebrations in Penang. Bangsawan, which was also developed in Penang, is a type of Malay theatre that incorporates Indian, Western, Islamic, Chinese and Indonesian influences. Boria is also indigenous to Penang, featuring singing accompanied by violin, maracas and tabla. Aside from these, the state has orchestras based in George Town, the Penang Philharmonic Orchestra, Penang Symphony Orchestra, as well as several chamber and school-based musical ensembles. Dewan Sri Pinang and Penangpac within Straits Quay are two of the major performing venues in the city. In 2012, as part of the George Town Festival, Lithuanian artist Ernest Zacharevic created a series of 6 wall paintings depicting local culture, inhabitants and lifestyles. In addition, several wrought iron caricatures have been installed within George Town, with each caricature detailing the city's history and the daily lives of its inhabitants. In recent years, the street art scene has also begun to grow out of the city, in areas such as Balik Pulau and Butterworth. In addition, art exhibitions are frequently held at cultural centres within George Town, such as the Hin Bus Depot. The Penang State Museum and Art Gallery in George Town is the state's primary public museum; it houses relics, photographs, maps, and other artefacts that document the history and culture of Penang. In recent years, private-run museums have sprung up throughout the city, such as the Camera Museum and the Penang Toy Museum. A handful of newer 3D visual and interactive museums have also been established, such as the Made-in-Penang Interactive Museum and the Penang Time Tunnel. Penang is home to a relatively wide variety of architectures, both historical and modern. The historical core of George Town has been inscribed as a UNESCO World Heritage Site due to its unique architectural and cultural townscape without parallel anywhere in East and Southeast Asia. Fort Cornwallis, in George Town, was the first structure built by the British in Penang. The city's UNESCO World Heritage Site also covers several important landmarks, including the City Hall, the Penang High Court, St. George's Church, the Eastern & Oriental Hotel and the Central Business District at Beach Street. Aside from European architecture, a huge assortment of Asian architectural styles also exists throughout George Town, exemplified by buildings like the Cheong Fatt Tze Mansion, the Pinang Peranakan Mansion, Khoo Kongsi, Kapitan Keling Mosque and Sri Mahamariamman Temple. 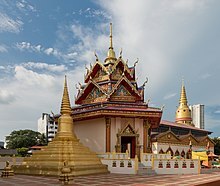 Meanwhile, the Siamese and the Burmese have also left a visible impact on certain landmarks within the city, such as Wat Chaiyamangkalaram, Dhammikarama Burmese Temple and Kek Lok Si. Aside from the colonial era architecture, Penang Island contains most of the skyscrapers within Penang, with the state's tallest buildings all located within the island. The tallest skyscrapers in George Town, and by extension, Penang, include the Komtar Tower, Setia V, Gurney Paragon and Arte S.
George Town, popularly regarded as the food capital of Malaysia, is renowned for its good and varied cuisine which incorporates Malay, Chinese, Indian, Peranakan, Thai and European influences. The city has been recognised by various publications, such as Time Magazine, CNN and Lonely Planet, as one of the Asian cities with the best street cuisine. According to Time Magazine in 2004, "nowhere else can such great tasting food be so cheap," whilst Robin Barton of the Lonely Planet described George Town as the culinary epicentre of the many cultures that arrived after it was set up as a trading port in 1786, from Malays to Indians, Acehenese to Chinese, Burmese to Thais. The various street dishes and delicacies of Penang include (but not limited to) asam laksa, char kway teow, curry mee, Hokkien mee, nasi kandar, oh chien (fried oyster omelette), lor bak, rojak, pasembur, tau sar pneah, chendol, ais kacang and tau sar pneah (bean paste biscuit). Penang's literacy rate stood at 98.2% as of 2010[update], whilst specifically, the literacy rate of Penang's youth between 15 and 24 years of age rose to 99.5% in 2014, after Selangor and Kuala Lumpur. Correspondingly, Penang has the third highest Human Development Index within Malaysia. As of 2017[update], Penang, including both the mainland and the island contains a total of 48 tertiary institutions (including universities, colleges, medical colleges, industrial training institutes and teaching schools), 12 international schools, 110 secondary schools, 271 primary schools and 602 kindergartens. In particular, George Town is home to some of Malaysia's oldest schools. Established in 1816, Penang Free School is the oldest English school in Southeast Asia, while the numerous missionary schools within the city include St. Xavier's Institution, St. George's Girls' School and Methodist Boys' School. In addition, the city is a pioneer in Chinese education within the region; following the establishment of Chung Hwa Confucian High School in 1904, several prominent Chinese schools were built, such as Chung Ling High School, Penang Chinese Girls' High School, Heng Ee High School, Jit Sin High School and Phor Tay High School. As a popular destination for expatriates, George Town contains a number of international schools as well, such as Uplands International School, Dalat International School, Tenby International School and Hua Xia International School. These schools offer primary and secondary education up to A Levels and International Baccalaureate. A few of these schools, such as Penang Japanese School and Chinese Taipei School, cater to expatriates of specific nationalities. Universiti Sains Malaysia (USM) is the premier public university within Penang. Established in 1969 as Malaysia's second university, it was originally named Universiti Pulau Pinang (University of Penang). The main campus is situated at Gelugor, while an engineering campus has been built in Nibong Tebal. As of 2018[update], it was ranked 207th in the QS World University Rankings, the fourth highest within the country. Other tertiary institutions within Penang include Wawasan Open University, Royal College of Surgeons in Ireland and University College Dublin Malaysia Campus, Han Chiang University College of Communication, DISTED College, Sentral College, SEGi College, KDU College, INTI International College, Equator Academy of Arts, Penang Skills and Development Centre and Lam Wah Ee Nursing College. Aside from these institutions, RECSAM, a research and training facility aimed at the enhancement of the science and mathematics education in Southeast Asia, is sited within Penang as well. The state also contains 107 libraries, including the Penang State Library and the Penang Digital Library. The latter, launched by the Penang state government in 2016, is the first digital library in Malaysia. Health care in Penang is adequately provided by the numerous public and private hospitals throughout the state. These hospitals have also helped Penang to emerge as the centre of medical tourism in Malaysia. The Penang General Hospital, administered and funded by the Malaysian Ministry of Health, is the main tertiary referral hospital within northern Malaysia. It is supported by five other public hospitals within Penang, all of which also come under the administration of the country's Ministry of Health. Aside from public hospitals, Penang is home to 15 private hospitals, including Penang Adventist Hospital, Lam Wah Ee Hospital, Mount Miriam Cancer Hospital, Gleneagles Medical Centre, Island Hospital, Loh Guan Lye Specialists Centre and Pantai Hospital. These hospitals cater not only to the local population, but also to patients from other states and foreign health tourists. Infant mortality rate within Penang dropped by 85% between 1970 and 2000 to 5.7 per 1,000 live births, while neonatal mortality rate also decreased by 84.7% within this corresponding period to 4.1 per 1,000 live births. As of 2017[update], Penang's life expectancy at birth stood at 72.5 years for men and 77.7 years for women. George Town was once the nucleus of Malaysia's print press. The nation's first newspaper was founded in the city – the Prince of Wales Island Gazette in 1806. The Star, currently one of Malaysia's top dailies, has its origins as a regional newspaper founded in George Town in the 1970s, while the country's oldest Chinese newspaper, Kwong Wah Yit Poh, was also established in the city in 1910. In 2011, the then Chief Minister of Penang, Lim Guan Eng, launched the Penang edition of Time Out. This version of the international listings magazine is published in three versions - a yearly guide, a website and a mobile app. The Penang state government also publishes its own multi-lingual newspaper, Buletin Mutiara, which is distributed for free every fortnight. The Penang-centric newspaper focuses on the current issues within Penang. Due to its well-preserved colonial-era cityscape, a number of movies have been filmed within George Town, such as Crazy Rich Asians, Anna and the King, Lust, Caution and You Mean the World to Me, the latter of which is the first movie to be filmed entirely in Penang Hokkien. Singaporean drama series, The Little Nyonya and The Journey: Tumultuous Times, were also filmed within the city's UNESCO World Heritage Site. In addition, the city became one of the pit-stops of The Amazing Race 16, The Amazing Race Asia 4 and The Amazing Race Asia 5. The available FM radio stations in Penang, both government (including Penang-based Mutiara FM) and commercial, are as listed below. The Second Penang Bridge, 24 km-long (15 mi), is the longest bridge in Southeast Asia. Penang Island is connected to the mainland by two bridges. The 13.5 km (8.4 mi) Penang Bridge, completed in 1985, spans the Penang Strait between Gelugor on the island and Perai on the mainland. Spanning 24 km (15 mi), the Second Penang Bridge is located further south, linking Batu Maung on the island to Batu Kawan on the mainland. The latter was opened to the public in 2014 and is currently the longest bridge in Southeast Asia. The North–South Expressway, a 966 km-long (600 mi) expressway along the western part of Peninsular Malaysia, passes through Seberang Perai. In addition, about 34.9 km (21.7 mi) of the Malayan Railway's West Coast Line also lies within Seberang Perai, with the Butterworth railway station serving as the main railway station within northern Malaysia. Aside from the regular Malayan Railway services, the Butterworth railway station is the southernmost terminus of the State Railway of Thailand's Southern Line and the International Express from Bangkok. Notably, the train station is also one of the main stops of the Eastern and Oriental Express service between Bangkok and Singapore. On Penang Island, the Tun Dr Lim Chong Eu Expressway is a vital coastal highway that runs along the island's eastern seaboard, connecting George Town with the Penang Bridge, the Bayan Lepas Free Industrial Zone, the Penang International Airport and the Second Penang Bridge. The Federal Route 6 is a pan-island trunk road, while the two major ring roads within George Town are the George Town Inner Ring Road and the Penang Middle Ring Road. In Seberang Perai, the major ring roads and expressways include the Butterworth Outer Ring Road (BORR) and the Butterworth–Kulim Expressway. Buses now form the backbone of public transportation within Penang. Public bus services are mainly provided by Rapid Penang, which operates 56 routes within Greater Penang, including interstate routes into Kedah and Perak. Among the routes are free-of-charge transit services such as the Central Area Transit, the Congestion Alleviation Transport and the Pulau Tikus Loop. In addition, the Hop-On Hop-Off bus service, which utilises open-topped double decker buses, has been introduced for tourists within George Town. Meanwhile, the only rail-based transportation system within Penang is the Penang Hill Railway, a funicular railway to the peak of Penang Hill. Opened in 1923, it is also the sole funicular railway system in Malaysia. Efforts are also being undertaken to promote pedestrianisation and the use of bicycles as an environmentally friendly mode of transportation. Dedicated cycling lanes have been paved throughout the city and in 2016, George Town became the first Malaysian city to operate a public bicycle-sharing service, with the inauguration of LinkBike. The Penang Sentral in Butterworth is the main rapid transit hub within Penang. Penang Sentral's location, adjacent to the Sultan Abdul Halim Ferry Terminal and the Butterworth railway station, allows it to function as a termini for public and interstate buses, ferry and train services. Penang International Airport (PEN) is located in Bayan Lepas at the southeast of Penang Island, 16 km (9.9 mi) south of George Town. It serves as the main airport for northern Malaysia, with frequent links to major regional cities such as Kuala Lumpur, Singapore, Bangkok, Jakarta, Ho Chi Minh City, Taipei, Hong Kong, Guangzhou and Doha. Penang International Airport is Malaysia's second busiest in terms of cargo traffic and recorded the third highest passenger traffic of all Malaysian airports as of 2013[update]. The airport is also a hub for two Malaysian low-cost carriers - AirAsia and Firefly. Among the international carriers that operate out of the airport are SilkAir, Scoot, Jetstar Asia Airways, Cathay Dragon, China Airlines, China Southern Airlines, Thai Smile and Qatar Airways. A Rapid Ferry crossing the Penang Strait towards George Town. The Port of Penang, the main harbour in northern Malaysia, is operated by the Penang Port Commission. The Port consists of seven facilities, with six of them in Butterworth and Perai on the mainland, including the North Butterworth Container Terminal, Butterworth Deep Water Wharves and the Prai Bulk Cargo Terminal. The Port of Penang, the third busiest seaport in Malaysia, handled more than 1.52 million TEUs of cargo in 2017. Meanwhile, Swettenham Pier, situated in the heart of George Town, is the sole Port facility on Penang Island. The pier now accommodates cruise ships, making it one of the major entry points into Penang. As of 2017[update], Swettenham Pier recorded 1.35 million tourist arrivals, thereby surpassing Port Klang as the busiest cruise shipping terminal in Malaysia; the pier has also attracted some of the world's largest cruise liners, such as the RMS Queen Mary 2. The pier also serves as a homeport for regional-based cruise ships. Occasionally, the Port of Penang hosts warships as well, including those from Singapore, the United States and most recently, China. 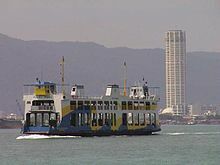 The cross-strait Rapid Ferry service connects George Town and Butterworth, and was formerly the only transportation link between Penang Island and the mainland until the completion of the Penang Bridge in 1985. At the time of writing, six ferries ply the Penang Strait between George Town and Butterworth daily. The City Stadium in George Town was the site where Mohd Faiz Subri scored the goal that won him the FIFA Puskás Award in 2017. Penang has a relatively well-developed sporting infrastructure. The Penang State Stadium in Batu Kawan is the main stadium within the state, whereas the City Stadium in George Town is the sole stadium within the city. Both stadia function as the home ground of the Penang FA. The SPICE Arena in Bayan Baru is another major sporting venue within Penang, consisting of an indoor arena and an aquatics centre. The SPICE Arena is also one of the major venues in Penang for meetings, incentives, conferences and exhibitions (MICE). The Nicol David International Squash Centre at Gelugor is one of the major squash training facilities in Malaysia and was reportedly where squash legend Nicol David first trained during her childhood years. George Town is also home to Malaysia's oldest equestrian centre, the Penang Turf Club, which was established in 1864. In addition, Penang contains a total of three golf courses, one of which is on Penang Island. The major annual sporting events within Penang include the Penang International Dragon Boat Festival and the Penang Bridge International Marathon. The former, held every December in Teluk Bahang, is a dragon boat race that has attracted several international teams, including those from Singapore, Thailand, Brunei, China, South Korea and Australia. The latter is a marathon which includes the Penang Bridge as its route. Held every November, it attracted a record 35,000 participants from 85 countries in 2017. Among the national and international sporting events that were hosted within Penang include the 2000 Sukma Games, the 2001 Southeast Asian Games and the 2013 Women's World Open Squash Championship. Penang has also hosted the 2018 Asia Pacific Masters Games, the first edition of a Masters Games within Asia. Water supply, which comes under the jurisdiction of the Penang state government, is wholly managed by the Penang Water Supply Corporation (PBAPP). The state enjoys the lowest domestic water tariff in Malaysia, at RM0.32 per 1,000 litres. Penang's water supply is obtained from several sources, namely the Air Itam Dam, Teluk Bahang Dam, Mengkuang Dam, Bukit Panchor Dam, Berapit Dam, Cherok Tok Kun Dam, the Guillemard Reservoir, the Penang Botanic Gardens and the Muda River. The latter, which forms Penang's northern border with Kedah, provides up to 80% of Penang's water supply. In 1904, George Town became the first city within British Malaya to be supplied with electricity, upon the completion of a hydroelectric scheme. Currently, electricity for industrial and domestic consumption is provided by Tenaga Nasional Berhad (TNB), which operates a 398MW oil-powered power plant at Gelugor. As of 2014[update], Penang had a recorded broadband penetration rate of 80.3%, the highest among all Malaysian states. Penang is also the first Malaysian state to provide its citizens with free internet connection. Penang Free Wi-Fi, launched by the Penang state government in 2008, aims to boost internet penetration throughout Penang and is provided free-of-charge. Its bandwidth speeds within the George Town city centre were increased to 3Mbit/s, while 1,560 hotspots have been installed throughout the state. Prominent people who hailed from Penang include Jimmy Choo, Nicol David, Khaw Boon Wan, Mohamad Sabu, Gobind Singh Deo, Anwar Ibrahim, P. Ramlee, Wu Lien-teh and Karpal Singh. ^ a b c d e f "Current Population Estimates Malaysia, 2018". Department of Statistics Malaysia. July 2018. ^ "Brunei is Home to Southeast Asia's Longest Oversea Bridge. Soon | Seasia.co". Good News from Southeast Asia. Retrieved 18 February 2019. ^ "Massive projects in place to alleviate urbanisation in Penang". 29 October 2016. Retrieved 17 November 2016. ^ a b c Christie, Clive (1998). A Modern History of Southeast Asia: Decolonization, Nationalism and Separatism. I.B.Tauris. ISBN 978-1-86064-354-5. ^ a b c Lianne Chia (26 January 2017). "A Silicon Valley of the East: Penang's thriving start-up community". Channel NewsAsia. Retrieved 27 May 2017. ^ a b Roughneen, Simon (15 July 2015). "Styling itself as the 'Silicon Valley of the East'". Nikkei Asian Review. ^ "Southeast Asian tech hubs race to become the next Silicon Valley - Nikkei Asian Review". Nikkei Asian Review. 24 October 2018. Retrieved 9 February 2019. ^ a b c d e f g h i j k l m n "My Local Stats - Penang 2017". Department of Statistics Malaysia. July 2018. ^ a b Idris, Imran. "About Penang". Penang International Halal Expo Conference. Retrieved 16 December 2017. ^ a b "Malaysia Millennium Development Goals Report 2015" (PDF). United Nations. January 2016. ^ a b Julia Tan (November 2014). "The last Siamese village of Penang". Penang Monthly. Retrieved 13 May 2017. ^ "The History of Penang Eurasians". Penang Tourism. 2 December 2013. Retrieved 5 July 2017. ^ a b "Tanjung Bungah in Numbers". Penang Monthly. March 2017. Retrieved 13 May 2017. ^ Opalyn Mok (19 August 2017). "Has Mandarin replaced Hokkien in Penang?". Malay Mail. ^ Gardner, Simon (2011). Heritage Trees of Penang. Penang: Areca Books. ISBN 978-967-57190-6-6. ^ "Penang, pearl of the Orient, in conservation struggle". The Daily Telegraph. 8 October 2005. ^ "Pulau Pinang Pulau Mutiara". Perpustakaan Negara Malaysia. 2000. Archived from the original on 9 April 2008. Retrieved 14 July 2008. ^ "Penang Info". Penang State Government. ^ Clement Liang. "Penang's Disappearing Thai Heritage". Penang Heritage Trust. ^ ปีนัง : พันเรื่องถิ่นแผ่นดินไทย โดยศ.ดร.เอนก เหล่าธรรมทัศน์ (Press release) (in Thai). Komchadluek. Retrieved 13 January 2013. ^ Ooi, Kee Beng (September 2012). "Penang before Francis Light (as the English saw it in 1905)". Penang Monthly. ^ "Betel Nut Island". Retrieved 13 September 2014. ^ a b "Prehistoric human skeleton found at Penang neolithic site". TODAY. 19 April 2017. Retrieved 29 April 2017. ^ a b "Penang to seek Unesco heritage status for Guar Kepah neolithic site". The Star. 26 April 2017. ^ Freedman Leonard, Rousham Emily (1996). Perspectives In Human Biology: Humans In The Australasian Region. World Scientific. ISBN 9789814497862. ^ Habibu, Sira (9 December 2013). "Lembah Bujang covers a larger area". The Star. ^ a b c d e f g "The Founding of Penang". www.sabrizain.org. Retrieved 25 May 2017. ^ a b "History of Penang". Visit Penang. 2008. Archived from the original on 2 January 2016. Retrieved 15 October 2016. ^ Swettenham; Frank Athelstane (1850–1946). "Map to illustrate the Siamese question". W. & A.K. Johnston Limited. University of Michigan Library. Retrieved 9 January 2016. ^ a b "Plan Of Prince Of Wales Island And Province Wellesley". www.nas.gov.sg. Retrieved 2 September 2017. ^ "Map of Prince of Wales Island, or Pulo Penang and Province …". www.nas.gov.sg. Retrieved 2 September 2017. ^ a b "Map Of Prince Of Wales Island And Province Wellesley, …". www.nas.gov.sg. Retrieved 2 September 2017. ^ a b "Documents Archive | Empire in Asia". www.fas.nus.edu.sg. Retrieved 1 May 2017. ^ a b c d e Lewis, Su Lin (2016). Cities in Motion: Urban Life and Cosmopolitanism in Southeast Asia, 1920–1940. United Kingdom: Cambridge University. ISBN 9781107108332. ^ a b c Jenkins, Gwynn (2008). Contested Space: Cultural Heritage and Identity Reconstructions : Conservation Strategies Within a Developing Asian City. LIT Verlag Münster. ISBN 9783825813666. ^ Zabidi, Nor Diana (11 August 2014). "Fort Cornwallis 228th Anniversary Celebration". Penang State Government (in Malay). Retrieved 15 May 2017. ^ a b Hockton, Keith (2012). Penang: An Inside Guide to Its Historic Homes, Buildings, Monuments and Parks. Petaling Jaya: MPH Group. ISBN 978-967-415-303-8. ^ Ooi, Keat Gin (2010). The A to Z of Malaysia. Rowman & Littlefield. ISBN 9780810876415. ^ Everett-Heath, John (2017). The Concise Dictionary of World Place Names. Oxford: Oxford University Press. ISBN 9780192556462. ^ "History of Penang". Visit Penang. 2008. Archived from the original on 2 January 2016. Retrieved 15 October 2016. ^ "The Founding of Penang". www.sabrizain.org. Retrieved 25 May 2017. ^ a b Ooi, Keat Gin (2015). "Disparate Identities: Penang from a Historical Perspective, 1780–1941" (PDF). Universiti Sains Malaysia. Archived from the original (PDF) on 7 February 2017. ^ "History". Seberang Perai Municipal Council. Retrieved 1 May 2017. ^ Ashley Jackson (November 2013). Buildings of Empire. OUP Oxford. pp. 7–. ISBN 978-0-19-958938-8. ^ Ooi, Kee Beng (2014). "When Penang Became A Spice Island". Penang Monthly. Retrieved 25 May 2017. ^ a b c d Khoo, Su Nin (2007). Streets of George Town, Penang. Penang: Areca Books. ISBN 978-983-9886-00-9. ^ Nordin, Hussin. "Malaysian Journal of Society and Space" (PDF). Charting the early history of Penang trading networks and its connections with the new ASEAN growth triangle (Malaysia-Indonesia-Thailand). ^ Nordin, Hussin (1 December 2005). "Networks of Malay Merchants and the Rise of Penang as a Regional Trading Centre". Southeast Asian Studies. 43 (3): 215–237. ISSN 0563-8682. ^ Koay Su Lin, Steven Sim (2014). "A history of local elections in Penang Part I: Democracy Comes Early". Penang Monthly. Retrieved 25 May 2017. ^ "Singapore becomes admin centre of the Straits Settlements - Singapore History". eresources.nlb.gov.sg. Retrieved 15 October 2016. ^ a b c Turnbull, C. M. "The Penang Story". Penang's Changing Role in the Straits Settlements, 1826–1946. ^ Khoo, Salma Nasution (2009). Penang and Its Region: The Story of an Asian Entrepôt. Singapore: National University of Singapore. ISBN 978-9971-69-423-4. ^ Wong, Yee Tuan (2015). Penang Chinese Commerce in the 19th Century: The Rise and Fall of the Big Five. Singapore: ISEAS-Yusof Ishak Institute. ISBN 978-981-4515-02-3. ^ a b c d e Langdon, Marcus (2014). George Town's Historic Commercial and Civic Precincts. Penang: George Town World Heritage Incorporated. ^ Wong, Chun Wai (30 March 2013). "Transformation of Bayan Lepas into free trade area does not diminish its attractions". The Star. ^ Opalyn Mok (1 October 2017). "Take a walk around old Butterworth to discover the town's heritage". Malay Mail. ^ Nicholas Chan (June 2015). "The history of Bukit Mertajam Part I – From agrarian village to economic hub". Penang Monthly. ^ Wong, Chun Wai (20 April 2013). "A cowboy town that was old Penang". The Star. ^ a b Ooi, Giok Ling (2 September 1991). "British Colonial Health Care Development and the Persistence of Ethnic Medicine in Peninsular Malaysia and Singapore". National University of Singapore. ^ "Formation of the Straits Settlements - Singapore History". eresources.nlb.gov.sg. Retrieved 25 May 2017. ^ Singapore, National Library Board. "Straits Settlements | Infopedia". eresources.nlb.gov.sg. Retrieved 25 May 2017. ^ "Asian Studies". Government Legislation for Chinese Secret Societies in the Straits Settlements in the Late 19th. Century. ^ a b c d e f Daniel Goh, P. S. (2014). "Between History and Heritage: Post-Colonialism, Globalisation, and the Remaking of Malacca, Penang and Singapore" (PDF). Trans-Regional and -National Studies of Southeast Asia. ^ "SUN YAT SEN | SUN YAT SEN MUSEUM". sunyatsenpenang.com. Retrieved 25 May 2017. ^ Singapore, National Library Board. "Sun Yat Sen | Infopedia". eresources.nlb.gov.sg. Retrieved 25 May 2017. ^ Bangkok, Barbara Crossette; BARBARA CROSSETTE is chief of The Times bureau in (30 June 1985). "Correspondent's Choice; on Penang Island, a Legend Lives". The New York Times. ISSN 0362-4331. Retrieved 10 December 2017. ^ a b Ajay Kamalakaran (20 May 2015). "Battle of Penang: When Malay fishermen rescued Russian sailors". Russia Beyond the Headlines. Retrieved 12 January 2016. ^ "Penang Evacuated - British Garrison Withdrawn NEW JAP THRUSTS IN MALAYA London, December 19 - Northern Times (Carnarvon, WA : 1905–1952) - 20 Dec 1941". Trove. Retrieved 15 October 2016. ^ a b Bayly, Christopher (2005). Forgotten Armies: The Fall of British Asia, 1941–1945. Harvard University. ^ Netto, Anil (6 October 2013). "Old Penang: The Sook Ching massacres of World War II - anilnetto.com". anilnetto.com. Retrieved 15 October 2016. ^ "THE ALLIED REOCCUPATION OF THE ANDAMAN ISLANDS, 1945". www.iwm.org.uk. Retrieved 25 May 2017. ^ "uboat.net - U-boat Operations- The Monsun U-boats - 3. Monsun boats". www.uboat.net. Retrieved 15 October 2016. ^ "German U-Boat Operations in Australian Waters". ^ "World War II: Yanagi Missions -- Japan's Underwater Convoys | HistoryNet". www.historynet.com. Retrieved 15 October 2016. ^ a b Barber, Andrew (2010). Penang At War : A History of Penang During and Between the First and Second World Wars 1914–1945. AB&B. ^ Paul H. Kratoska (1998). The Japanese Occupation of Malaya: A Social and Economic History. C. Hurst & Co. Publishers. pp. 296–. ISBN 978-1-85065-284-7. ^ a b Koay, Su Lin (1 October 2016). "Penang: The Rebel State (Part Two)". Penang Monthly. Retrieved 15 October 2016. ^ "Journal of Southeast Asian Studies". The Penang Secession Movement, 1948–1951. ^ a b Brash, Celeste (2008). Kuala Lumpur, Melaka and Penang. Lonely Planet. ISBN 978-1-74104-485-0. ^ a b "Higher Education in Regional and City Development : State of Penang, Malaysia". OECD. ^ a b c Ooi, Kee Beng (December 2009). "Tun Lim Chong Eu: The past is not passé". Penang Monthly. Retrieved 30 November 2017. ^ a b c d Ooi, Kee Beng (2010). Pilot Studies for a New Penang. Singapore: Institute of Southeast Asian Studies. ISBN 9789814279697. ^ Ng, Su-Ann (7 November 2004). "Penang losing its tourism lustre". The Star. ^ "Tsunami impact in Penang, Malaysia: Our island, our world". aliran.com. Retrieved 6 December 2017. ^ Saravanamuttu Jayaratnam, Lee Hock Guan, Ooi Kee Beng (2008). March 8: Eclipsing May 13. Singapore: Institute of Southeast Asian Studies. ISBN 9789812308962. ^ a b "Eight new sites, from the Straits of Malacca, to Papua New Guinea and San Marino, added to UNESCO's World Heritage List". UNESCO. 7 July 2008. Retrieved 7 July 2008. ^ Sandeep Chaurley (27 December 2013). "Nine years on, Penang's tsunami pain still lingers". Malay Mail. Retrieved 24 June 2017. ^ Lim, H. S. (2011). "TSS Mapping Using THEOS Imagery over Penang Island, Malaysia". Universiti Sains Malaysia. ^ Chau, Loon Wai (2005). "Probing Different Centralities in City Regions: A space-syntactic approach". Techne Press. 1. ^ Arnold Loh (30 December 2016). "Gurney Drive's reclamation project will transform the seaside promenade". The Star. Retrieved 26 May 2017. ^ "E & O gains more time to finish Seri Tg Pinang reclamation". The Star. 21 January 2016. ^ "Cover Story: IJM Land to unveil two much-awaited projects". The Edge Markets. 13 April 2017. Retrieved 26 May 2017. ^ "History". Penang Botanical Gardens. ^ Chow, Mei Mei (6 March 2018). "Penang's commitment to safeguard its forests". Malaysiakini. Retrieved 8 March 2018. ^ Ngai, Weng Chan (1998). "Environmental Hazards Associated with Hill Land Development in Penang Island, Malaysia: Some Recommendations on Effective Management". Disaster Prevention and Management. 7. ^ "The smallest national park in the world: Penang National Park". Time Out Penang. 27 October 2014. ^ "The Tropical Spice Garden Story". Tropical Spice Garden. Archived from the original on 18 February 2018. ^ Lakhwani, Nanda (March 2016). "Sensitising Visitors to Mother Nature's Wealth". Penang Monthly. ^ Opalyn Mok (16 December 2016). "A boyhood passion that became the Penang Bird Park". Malay Mail. ^ Ford, Peter (5 October 2017). "Malaysia's Forgotten Jerejak Island". The Diplomat. Retrieved 4 March 2018. ^ "Penang/Bayan Lepas Climate Normals 1961–1990". National Oceanic and Atmospheric Administration. Retrieved 4 February 2015. ^ "Sumatra haze blankets northern Malaysia". Planet Ark. 23 September 2002. Retrieved 19 July 2008. ^ "Intergovernmental Oceanographic Commission". ioc-unesco.org. Retrieved 28 February 2018. ^ "Malaysia: metropolitan areas". World Gazetteer. Archived from the original on 5 December 2012. Retrieved 14 July 2008. ^ "Achieving A System of Competitive Cities in Malaysia: Main Report". World Bank Group & Khazanah Nasional. November 2015. ^ Mustafa, Siti Fairuz. "Portal Rasmi Kerajaan Negeri Pulau Pinang – Governor". Penang State Government. Retrieved 7 August 2016. ^ "Constitution of Malaysia" (PDF). ^ a b c "Constitution of the State of Penang" (PDF). Penang State Legislative Assembly. ^ "Local government in Malaysia: Types, functions, organisation, members and budget". Penang Monthly. November 2014. ^ Ganason, Anesh. "Land Administration System in Malaysia: Building Institutional and Organisational Capacity for Coordinating Land Administration between the Federal and State Authorities" (PDF). Universiti Kebangsaan Malaysia. ^ a b c "Brief History". Penang Bar Committee. Retrieved 5 March 2018. ^ "Court Directory". Penang Bar Committee. 23 October 2017. ^ "Consulates". Penang State Government Directory. ^ "Penang-Kanagawa twin city ties renewed to mark 20th anniversary". The Star. 22 November 2011. ^ "The inauguration ceremony of the Consulate General of the People's Republic of China in Penang". Penang State Government. 22 December 2015. ^ "Sister cities". City of Fremantle. Retrieved 11 March 2017. ^ a b c "Migration Survey Report 2016". Malaysian Department of Statistics. 26 May 2017. ^ Opalyn Mok (29 October 2016). "Massive projects in place to alleviate urbanisation in Penang". Malay Mail. Retrieved 26 November 2016. ^ "Migration report: Selangor, Penang most popular with locals". Free Malaysia Today. 30 May 2017. Retrieved 3 July 2017. ^ Christopher Tan (24 June 2017). "Penang ranks second in influx of new residents". The Star. ^ a b c d e f g "Population Distribution and Demography" (PDF). Malaysian Department of Statistics. Archived from the original (PDF) on 13 November 2013. ^ a b "Peninsula states asked to give East Malaysians time off for festivals". The Borneo Post. 28 May 2017. ^ Jaime Koh (26 August 2013). "Peranakan (Straits Chinese) community". National Library Board of Singapore. Retrieved 26 May 2017. ^ Lee, Su Kim (2008). "The Peranakan Baba Nyonya Culture: Resurgence or Disappearance?" (PDF). Universiti Teknikal Malaysia Melaka. ^ Heaver, Stuart (10 May 2014). "High society". South China Morning Post. ^ Wong, Chun Wai (4 January 2014). "Penang's Kelawei Road where the Eurasians set words to music". The Star. ^ a b Opalyn Mok (2 August 2016). "Penang Hokkien will be 'dead' in 40 years if people stop using it, says language expert". Malay Mail. ^ "NECF Malaysia". www.necf.org.my. Retrieved 13 October 2016. ^ Abdul Rahim, Hajar (2015). "Bahasa Tanjong: The Heritage Language of the Jawi Peranakans of Penang" (PDF). Kajian Malaysia. 33. ^ "Dialects and Languages in Numbers". Penang Monthly. May 2017. Retrieved 27 May 2017. ^ Lin, Rouwen (3 October 2010). "The Telugu heritage". The Star. ^ Ooi Kok Hin, Julia Tan. "Penang Hokkien On Life Support". Penang Monthly. Retrieved 27 May 2017. ^ Penang Hokkien Dialect for Penangites & Tourists. George Town, Penang: Areca Books. 2008. ISBN 978-983-40774-3-3. ^ Ann Tan (30 July 2009). "Mind your Hokkien". The Star. ^ Bernard Cheah (17 August 2016). "Translating Penang Hokkien to English with ease". The Sun. ^ Arnold Loh (29 December 2015). "Shooting to begin for first Penang Hokkien film". The Star. ^ "Indian Muslims in Penang: Role and contributions". Penang Tourism. 8 April 2015. Retrieved 5 July 2017. ^ "Koay Jetty: The social evolution of the Hui people in Penang". Penang Tourism. 5 February 2015. Retrieved 5 July 2017. ^ K. Jerryson, Michael (2017). The Oxford Handbook of Contemporary Buddhism. Oxford: Oxford University Press. ISBN 9780199362387. ^ "Street of Harmony". Time Out Penang. 27 August 2013. Retrieved 15 February 2017. ^ Chong, Kah Yuan (18 November 2015). "Street of peace and harmony". The Star. ^ Wong, Chun Wai (6 July 2013). "The Jewish community in Penang is all but gone leaving only tombs behind". The Star. ^ "Consumer Price Index Malaysia February 2018". Department of Statistics Malaysia. 21 March 2018. ^ a b Mashut, Mohd Ezli (1 August 2017). "LKAN 2016: Selangor second lowest in debt after Penang". Selangor Kini. ^ a b c Parker, Pamela (22 January 2018). "The Malaysian region that became a hardware hub". BBC. ^ Nambiar, Predeep (29 November 2016). "Guan Eng: Penang airport may turn into 'pasar malam'". Free Malaysia Today. Retrieved 5 March 2017. ^ "World Bank Country and Lending Groups". World Bank. Retrieved 28 July 2018. ^ a b Ong, Kian Ming (13 October 2017). "Penang's economy is healthy and strong". Malaysiakini. ^ "Projects Approved by State, 2017 and 2016". Malaysian Investment Development Authority. Retrieved 6 March 2018. ^ "Malaysia Commercial Real Estate Investment Sentiment Survey 2016" (PDF). Knight Frank. ^ Lim, Guan Eng (22 February 2012). "1.6 million Penangites deserve full credit for the historic feat of Penang being No. 1 in Malaysia in manufacturing investment". Democratic Action Party. ^ a b c Eileen Ng (14 May 2016). "The Big Read: Penang takes a leaf from S'pore, and bids to become a competitor". TODAY. Retrieved 6 March 2017. ^ a b c Ong, Wooi Leng (April 2015). "Penang's economy in 2015: Growth continues, but more slowly". Penang Monthly. ^ a b "A brief history of Prai". Butterworth Your Time. Retrieved 5 March 2017. ^ Joshua Woo (September 2016). "The Mainland Awakens". Penang Monthly. Retrieved 9 March 2018. ^ a b c "Gold and jewellery cluster formed at Batu Kawan Industrial Park". The Star. 18 May 2017. ^ Hilmy, Imran (5 December 2014). "Penang accounts for 50% of medical tourists". The Sun. ^ a b "Medical tourism hale and hearty". The Star. 29 January 2011. ^ Lim Yoke Mui; Nurwati Badarulzaman; A. Ghafar Ahmad (20–22 January 2003). "Retail Activity in Malaysia : From Shophouse to Hypermarket" (PDF). School of Housing, Building and Planning, University of Science, Malaysia. Pacific Rim Real Estate Society (PRRES). Archived from the original (PDF) on 24 January 2016. Retrieved 24 January 2016. ^ Ng, Su-Ann (28 March 2006). "Bazaar bustling with bargain hunters". The Star. ^ "Special Report: Importance of services sector grows". Malaysian Investment Development Authority. 12 October 2017. Retrieved 9 March 2018. ^ Tan, C. K. (5 January 2016). "Penang eyes foreign companies to set up IT operations". Nikkei Asian Review. ^ Daniel Tay (11 June 2015). "Tech in Asia - Connecting Asia's startup ecosystem". www.techinasia.com. Retrieved 28 May 2017. ^ "The Launching of PENANG @CAT Programme". Penang State Government. 17 March 2017. Retrieved 28 May 2017. ^ "2016 ICCA Statistics Report: Country and City Rankings". International Congress and Convention Association. June 2017. ^ Looi, Sue-Chern (5 February 2018). "Penang records RM1 billion in economic impact from business events". The Malaysian Insight. ^ a b "Penang Meeting Planners Guide 2017-18". Penang Convention & Exhibition Bureau. ^ Mohd Ali, Intan Amalina (8 January 2018). "Venue in city centre ideal for wedding receptions". The Star. ^ David Tan (15 December 2013). "Penang's new financial hub". The Star. ^ "List of Company Secretaries, Taxation and Accounting Services" (PDF). Invest Penang. ^ "Pulau Pinang". Malaysian Employees Provident Fund (in Malay). Retrieved 27 May 2017. ^ "E&O Edition 20" (PDF). Eastern & Oriental Berhad. ^ Koay, Su Lyn (December 2014). "A history of local elections in Penang Part II: A legacy to protect". Penang Monthly. Retrieved 23 March 2018. ^ "Prince Charles, Camilla arrive in Penang for one-day official visit". Malaysiakini. 6 November 2017. ^ "PIA catat pertumbuhan 8% ketibaan penumpang, tunggu pelaksanaan projek pembesaran" (PDF). Buletin Mutiara. February 2018. ^ "More liners to visit Penang". The Star. 16 December 2017. ^ Sivanandam, Hemananthani (12 March 2018). "Nazri Aziz: Tourism Tax collection will be split 50-50 between state and federal governments". The Star. ^ "Looking for a 2016 vacation? Here are 16 must-see destinations". Los Angeles Times. 26 December 2015. ISSN 0458-3035. Retrieved 27 May 2017. ^ Aaron Ngui (31 December 2015). "Penang one of 2016's 'best budget travel destinations'". The Sun. ^ Renzulli, Kerri Anne, Megan Leonhardt (15 June 2017). "10 Amazing Asian Vacations That Won't Cost a Fortune". Time. Retrieved 1 August 2017. ^ Butler, Alex (28 October 2015). "Lonely Planet Best in Travel 2016: countries, cities, regions revealed". Lonely Planet. ^ a b Goldberg, Lina (22 February 2013). "Asia's 10 greatest street food cities". CNN. Retrieved 17 October 2016. ^ a b Chong, Kah Yuan (26 February 2018). "Penang Port allocates RM186mil capex for two years". The Star. ^ Chong, Kah Yuan (26 February 2018). "Penang Port allocates RM186mil capex for two years". The Star. ^ "Visit Penang Year 2017". Penang Global Tourism. Retrieved 2 June 2017. ^ Edmund Lee (13 April 2015). "Grand Songkran festival celebration in Penang". The Sun. ^ "Information and Culture". Consulate-General of Japan in Penang. Retrieved 31 May 2017. ^ N. Trisha (14 March 2016). "St Patrick's Day celebrated with merriment over four days". The Star. ^ Jeremy Tan (9 October 2010). "Oktoberfest cheer in Penang". The Star. ^ "Festivals in numbers". Penang Monthly. November 2015. Retrieved 19 February 2018. ^ Sohilli, Ainul Wardah (February 2017). "Penang Hot Air Balloon Fiesta 2017 memberangsangkan, jumpa lagi tahun depan!" (PDF). Buletin Mutiara. ^ a b "December in Penang!". Penang Global Tourism. ^ Gopinath Rao.S. "Bangsawan". Angelfire.com. Retrieved 3 January 2011. ^ "The case for bangsawan". Archived from the original on 29 October 2013. Retrieved 13 September 2014. ^ Minni Ang. "Boria". Musicmall-asia.com. Archived from the original on 14 May 2011. Retrieved 3 January 2011. ^ "About us". Penang Philharmonic Orchestra. ^ Lim, Serene (24 April 2015). "The good, bad and ugly of street artist Ernest Zacharevic's murals". TODAY. Retrieved 26 April 2015. ^ "Penang Street Art: Caricatures". Penang Trails. 24 March 2016. ^ Thevadass, Logeiswary (14 February 2016). "Balik Pulau a canvas for street artist Volchkova". The Star. ^ Opalyn Mok (2 February 2017). "A Butterworth art scene? It's already here". Malay Mail. ^ Nicole Chang (2017). "Hin Bus Depot – Derelict No More". Penang Monthly. Retrieved 27 May 2017. ^ "About Museum | Official Website Penang State Museum Board". www.penangmuseum.gov.my. Retrieved 28 February 2018. ^ "Penang Art Gallery: Art Galleries and Museums in Penang Area, Malaysia". Penang.world-guides.com. Retrieved 3 January 2011. ^ p-ramlee/gallery penang Archived 4 March 2016 at the Wayback Machine P-ramlee.com. Retrieved on 11 August 2011. ^ "Made In Penang Interactive Museum :: 美因槟廊". www.madeinpenang.my. Retrieved 18 October 2016. ^ "Penang Time Tunnel | The History Museum". penangtimetunnel.com. Retrieved 18 October 2016. ^ Cripps, Karla (13 July 2017). "George Town, Penang: Asia's greatest street food city?". CNN. ^ a b Fitzpatrick, Liam (15 November 2004). "Best of Asia – Best Street Food". Time. Retrieved 3 January 2011. ^ a b Barton, Robin (2 February 2014). "Where are the foodies going in 2014?". The Independent. Retrieved 18 October 2016. ^ Abdul Rahman, Noor Ashikin (10 January 2017). "Paradise in Penang". AsiaOne. Retrieved 7 March 2017. ^ "Report on Educational and Social Characteristics of the Population 2010". Department of Statistics, Malaysia. https://www.statistics.gov.my/images/stories/files/LatestReleases/population/Summary_Findings_on_Education_%20and_Social_Characteristics_of_the_Population_2010.pdf. ^ a b "List of colleges and institutions of higher learning in Penang" (PDF). investPenang. 21 February 2011. ^ a b "List of expatriate schools in Penang" (PDF). investPenang. 19 July 2016. ^ "Penang Statistics: Quarter 3, 2017" (PDF). Penang Institute. ^ a b "Secondary – Universal Hua Xia International School (Penang)". huaxia.edu.my. Retrieved 28 February 2018. ^ "Universiti Sains Malaysia (USM)". Top Universities. 16 July 2015. Retrieved 18 October 2016. ^ "QS World University Rankings 2018". Quacquarelli Symonds. 7 June 2018. Retrieved 22 June 2018. ^ "Education" (PDF). Penang State Government. ^ Francis, Jolynn (3 June 2016). "Paperless library option". The Star. ^ "Penang health statistics" (PDF). Penang State Health Department. ^ "Health care" (PDF). Penang State Government. ^ "Getting back its mojo". The Economist. 13 August 2011. ^ Wong, Chun Wai (7 December 2013). "Penang is home to many of Malaysia's earliest English newspapers". The Star. ^ Criz, Penang-based blogger (19 June 2011). "The Official Launch of TimeOut Penang". Retrieved 26 February 2014. ^ "Time Out Penang". Malaysia. Retrieved 26 February 2014. ^ a b "Profil". Buletin Mutiara. 18 April 2013. ^ Royce Tan, Aishah Afandi (24 April 2014). "TV series 'Indian Summers' to be shot in Penang". The Star. ^ "Radio stations in George Town". World Radio Map. ^ Arnold Loh (22 August 2015). "Through the wheels of time". The Star. ^ Siow, Yuen Ching (29 March 2006). "Glorious days of Penang's trams". The Star. ^ "The Legacy Of Penang Trishaw". www.penang-vacations.com. Retrieved 18 October 2016. ^ Opalyn Mok (5 March 2018). "Penang to launch another free bus service next month". Malay Mail. ^ "Main page". Penang Hop-On Hop-Off. ^ Opalyn Mok (9 August 2016). "Making George Town more walkable, one street at a time". Malay Mail. ^ Opalyn Mok (1 March 2018). "Penang streetscapes to be more pedestrian friendly, says exco". Malay Mail. ^ "Penang tourism: Promoting cycle lanes in urban heritage areas". The Sun. 24 January 2015. ^ Arnold Loh (29 April 2016). "Pedal power can set a new benchmark of liveability in Penang". The Star. Retrieved 18 October 2016. ^ Lilian Chan (8 February 2017). "Penang to be first cycling state". Buletin Mutiara. ^ "Handy Penang airport information from Skyscanner". www.skyscanner.com.my. Retrieved 19 February 2018. ^ a b Filmer, Andrea (1 October 2015). "Is Penang's tourism on the right track?". Penang Monthly. Retrieved 17 October 2016. ^ Edmund Lee (20 December 2017). "Swettenham Pier surpasses Port Klang as top port of call for cruise ships". The Sun. ^ "Newspaper Article - S'pore gunboats call at Penang". eresources.nlb.gov.sg. Retrieved 18 October 2016. ^ "US Navy ship calls at Penang". The Star. 30 September 2005. ^ Lo, Tern Chern (13 May 2017). "Chinese warships visit Penang". The Star. Retrieved 16 May 2017. ^ "Penang attractions painted on two ferries". The Star. 7 August 2017. Retrieved 22 September 2017. ^ "Nicol David International Squash Centre". Time Out Penang. Retrieved 18 October 2016. ^ "Golf Courses in Penang". Golfasian. ^ Chong, Kah Yuan (4 December 2017). "China team awed by experience at Penang boat race". The Star. ^ Chong, Kah Yuan (27 November 2017). "Penang Bridge marathon: Kenyans sweep top prizes". The Star. ^ "Penang will host 2018 first Asia Pacific Masters Games". Malay Mail. 1 December 2016. ^ "Home users the main guzzlers". The Star. 28 April 2017. ^ Maidinsa, Jaseni (July 2017). "Sungai Dua: Penang's Most Highly Evolved Water Treatment Plant". Penang Water Supply Corporation. ^ Ong, Siou Woon (June 2012). "Safeguarding Penang's water supply". Penang Monthly. Retrieved 9 March 2018. ^ Sunderland, David (2017). British Economic Development in South East Asia, 1880–1939. Routledge. ISBN 9781351573092. ^ Mohd Yusof, Ahmad (2012). "Modelling Electricity Generation in Malaysia using IMEM: Initial Results" (PDF). Universiti Kebangsaan Malaysia. ^ "Pocket Book of Statistics" (PDF). Malaysian Communications and Multimedia Commission.